This project investigates the organizational and spatial dimensions of waste, with a special focus on the collection of urban waste and processes of selection for recycling. 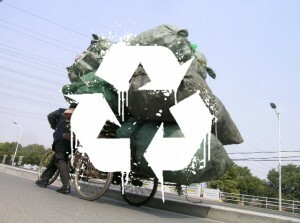 In Shanghai the treatment of municipal waste is an everyday routine. Alongside official procedures for waste management, lateral networks with high flexibility and efficiency have developed. The system of interconnected scavengers, selectors and street cleaners is made visible when spatially registered. A street corner, a wastebin, a collection depot become temporary nodes of exchange. Our investigation of the logistics of municipal waste and its attendant economies is made accessible by combining drawing techniques with photography. In this seminar we discuss the discrepancies between formal and informal uses of public space and waste as they connect with different modes of self-organized labour. The study of waste in Shanghai is part of a broader analysis conducted in Eastern and Western Europe. Maren Koehler (Shanghai) and Bettina Vismann (Berlin) are both trained as architects. In the past 10 years they have collaborated on projects combining research, architectural practice and academic teaching. « Shanghai: City of Tomorrow?